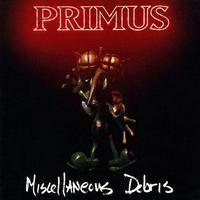 One of the band's most underrated releases acts as an awesome prologue to the Pork Soda era of Primus. Miscellaneous Debris isn't anything too comprehensive: a simple, five-song EP completely composed of covers. The material is surprisingly varied ranging from Peter Gabriel to XTC to Pink Floyd, but all of the songs sharing Primus' love for the quirky and obscure. The artsy stuff takes precedence over more predictable choices like Rush; essentially, Primus challenge themselves the whole way through. While some songs are a bit too much of a stretch to fit Primus' identity (Peter Gabriel's "Intruder" is probably the most out-of-place of the five), the overall song selection is just as against-the-grain as Primus themselves.